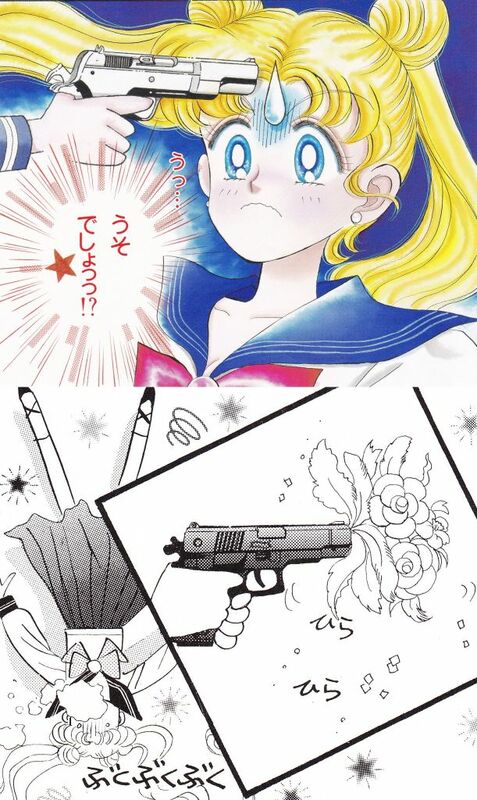 Interestingly enough, it looks like Ms. Takeuchi actually used two different designs for the gun ChibiUsa wields, though seeing as this is a difference between an opening cover image and one of the panels inside the manga itself, it’s actually entirely likely that the images were drawn at two completely different times and she either simply lost track of her reference pictures, or changed her mind later when she had to draw it in color for a close-up. If you take a look at these two images closely, you can see that the design differs pretty dramatically in the look of the hammer, how the front of the barrel tapers off, the design of the finger guard, and even the diagonal slashes on the left (they go all the way down in the bottom image, but only halfway in the top). Also, if you look closely (really, really closely), you can see a design like a waving flag underneath where the shell casing ejects from the pistol in the bottom image, which is very similar to the Walther Arms company logo.2 However, I’m unable to find any guns released by them matching this design, so it may just be a Takeuchi-original. 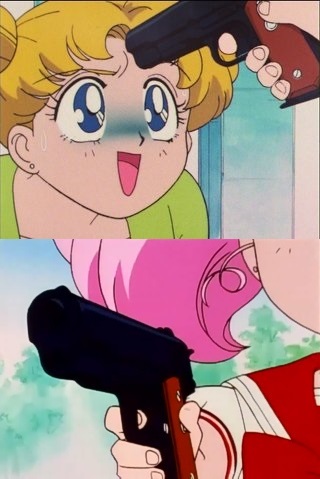 You can tell that she didn’t take the scene all that seriously anyway, since even though the gun fires, ChibiUsa’s finger isn’t on the trigger, and the hammer is still cocked back. Interesting! Shouldn’t she be more terrified? 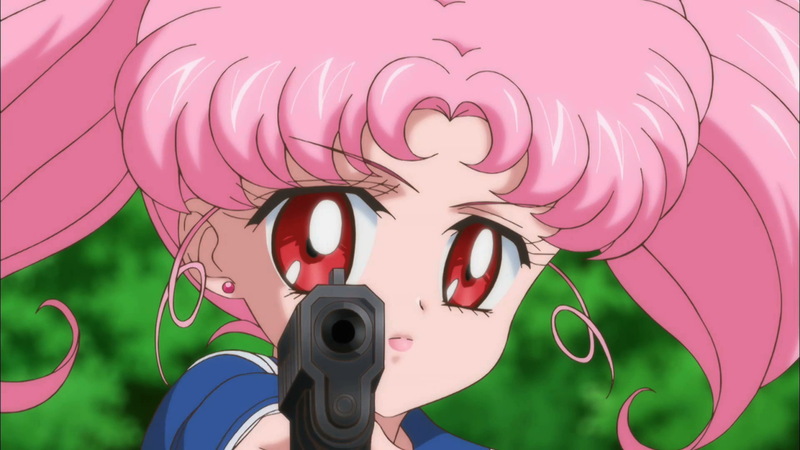 Now, moving onto the Sailor Moon R anime, fortunately it’s a completely different story and here they actually use a pistol that’s pretty easy to trace, design and all! One interesting note about the particular version she’s holding here is that, as you can see underneath her thumb in both images, the gun handle has the optional medallion inlay in it. It’s such a small detail that I have to wonder why it got put in. Maybe the reference pictures the artist was looking at had one? Recently, I asked a few friends of mine (an iPhone game artist and a published manga artist) why it is that so often real-world cards, weapons, and other various day-to-day items appear in anime and manga. Is it an homage? Reference? The answer, I learned, is much simpler than that: it’s easy to imagine an idea of what a car is, but when you have to draw one and convince the viewer, it’s much easier to just draw something real. I guess it’s obvious now that I think about it, but it’s interesting to know that there’s actually a reason behind this. Though, of course, when it comes to what to copy, there’s still a good deal of lee-way for the artists and designers to express their own interests! ← How Smart Is Mamoru in the Anime and Manga? 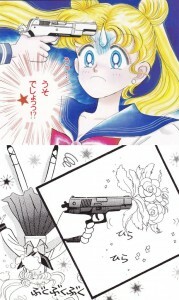 I sometimes think what would have happened if she would have “shot” Usagi if Mamo-chan wasn’t there. In the anime, I can easily imagine Usagi bawling her eyes out and thinking she’s dead.